Herbert Glacier Area is in a granite geologic zone unlike some other rocks around Juneau. The area has a southern exposure and is one of the sunniest places in Juneau. That’s not saying a lot. 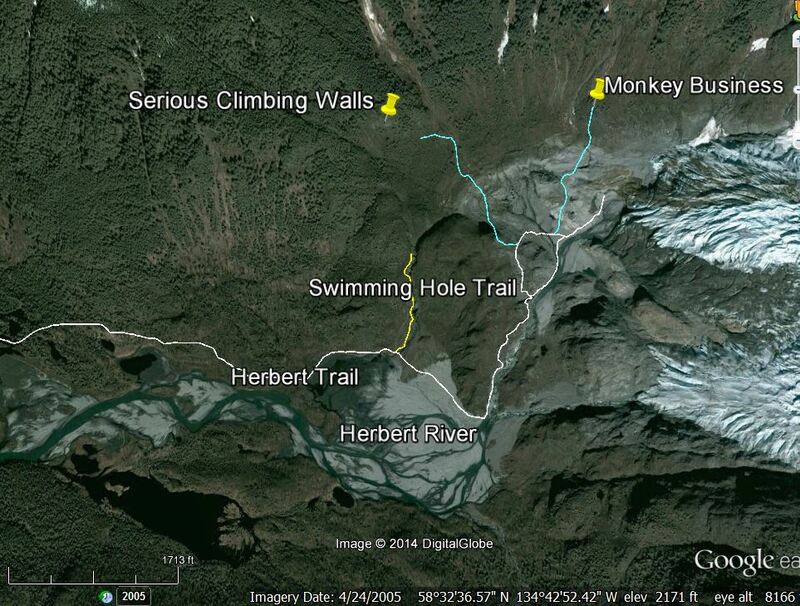 There are two cliffs that I have been viewing at Herbert Glacier area that don’t require crossing the river. 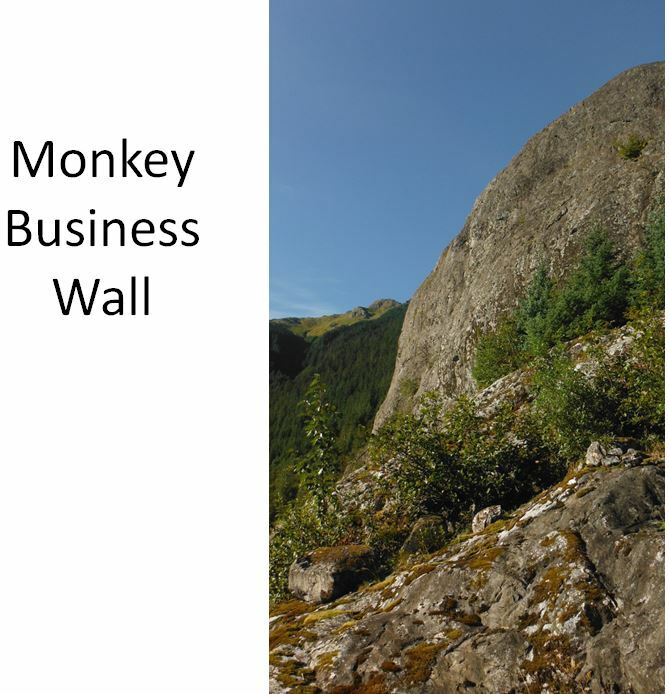 I call these the Monkey Business Wall and Serious Climbing Dome. There are actually a couple different domes at Serious Climbing, so named after Thursday evening training at the Rock Dump. Seriously. 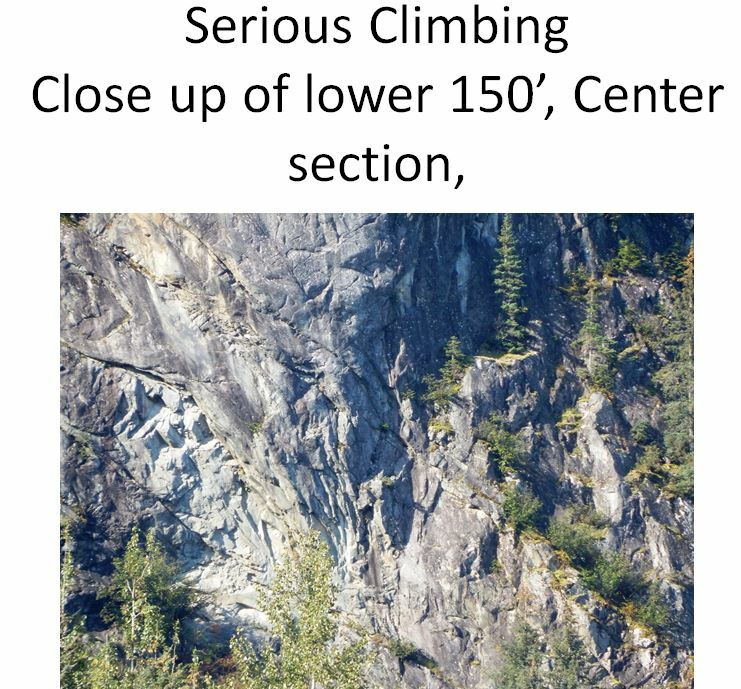 There is a trail leading to within 150 yard of the base of Serious Climbing, Serious Climbing looks to be a fairly wide cliff that I estimate at two or three pitches. It’s pretty tall and fairly wide with a lot of potential routes. This wall looks cool. Monkey Business is considerably smaller than Serious Climbing but a very nice cliff. It’s about a ½ mile west of where the river emerges from the glacier. 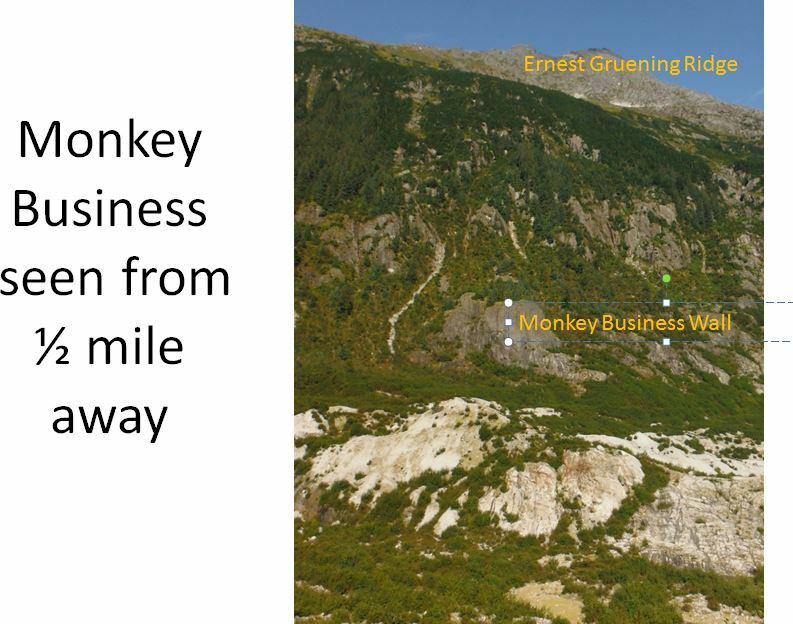 It takes about 30 minutes to hike from where you park the bikes to Monkey Business. The second time I went up there it took me a little over an hour from the car. Top roping requires two ropes. It’s about 125 feet tall. The trail is up the right side. Set the top rope from trees and have a lot of webbing and/or static line. It’s a spectacular view up there. You are looking down on the spot where the Herbert River gushes from the bottom of the glacier. It was hard to get a pic of the whole wall once I got up close. There is a lot of climbing up there of various skill levels. I put all this stuff on a map below. 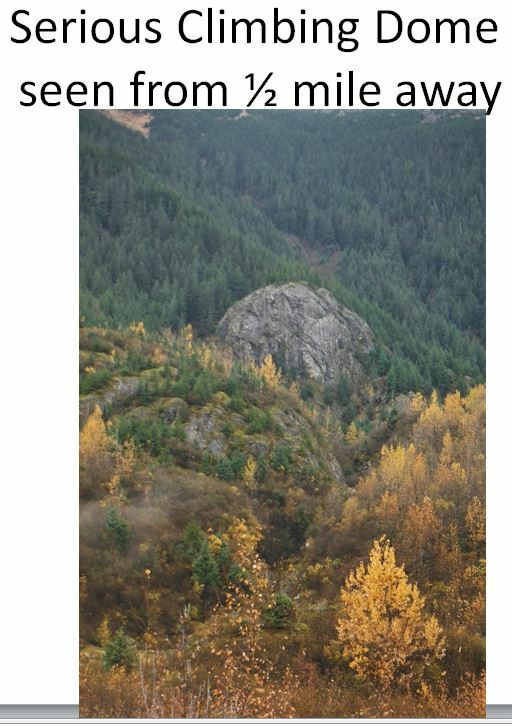 A real problem with the aerial photos (map) is they were taken from the sky so vertical features like cliffs don’t show up. Thanks for putting this up! Is there climbing up near the glacier across the river? To my understanding there has not been any development out there. With so few climbers around Juneau, progress is slow. I brushed out a trail to the base a few years ago but I wager the alders have taken it back. That was the only day I was out there and I didn’t climb. It was December, raining, and I was alone except for my dog so I spent the day lopping a path through alders. I was hoping more people would go and maybe somebody has. 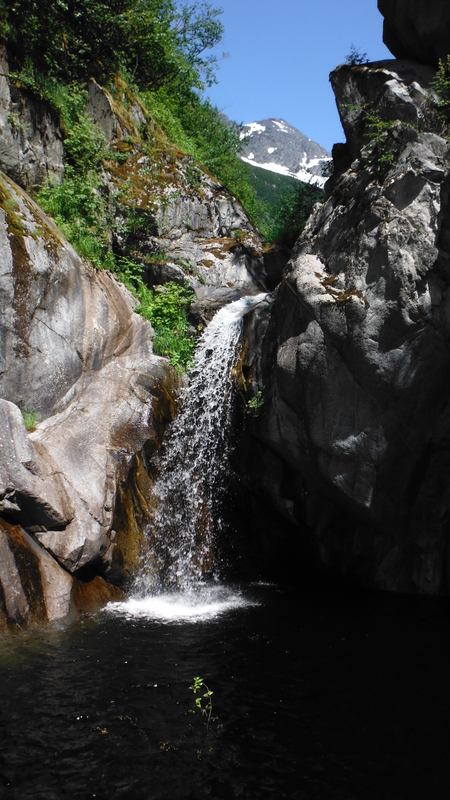 It is one of four “undeveloped” places in Juneau that I think could be really good that could be accessed with about hour walk. Not everybody has access to a helicopter 😊. 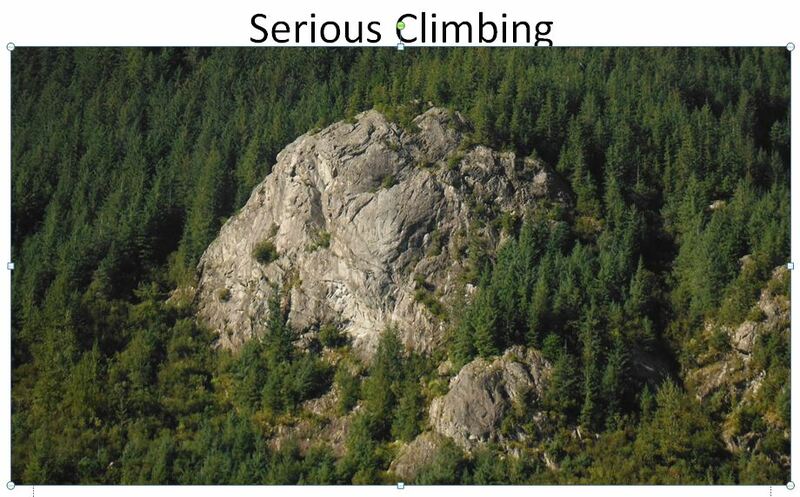 The rock is granite, not the schist we have in town, and it faces south so it’s not as moss covered as some cliffs. There seems to be a growing group of people that want to develop routes. The upcoming weather seems good to go since the underbrush hasn’t grown in yet.